Distinction, discriminitive insight, luminosity and transparency. In Book III of Patanjali’s Yoga Sutras, the cognitive capacity for distinction that is commonly used to distinguish red from blue, rain from snow, or any other seeming difference is now used in a vipashyana way. One is to notice the usually not noticed of the luminous transparency of life. Using the ability to distinguish has become a habit that denies the greater elegance of all that appears and appears to exist. There is another way to live with and use this transcendent cognitive capacity. 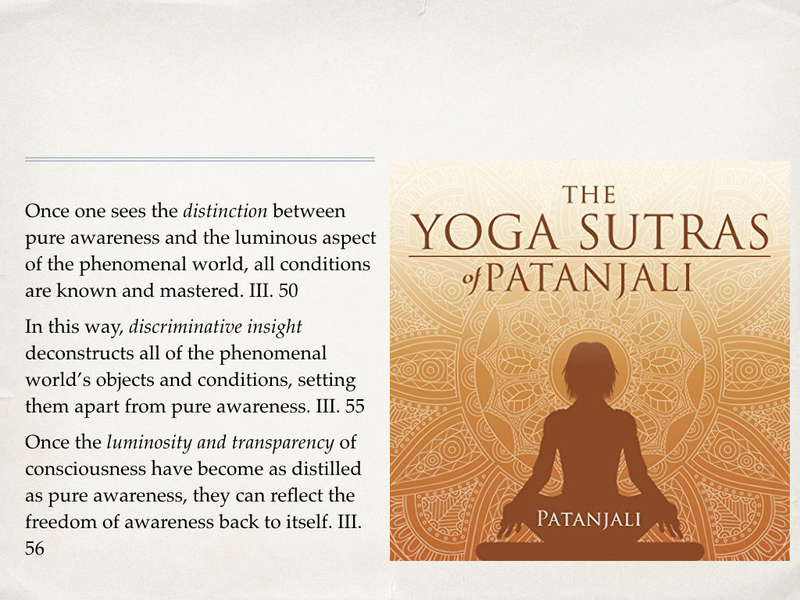 A several minute explanation of Patanjali’s instruction is given before the meditation; so there is no need to type it here. Vipashyana is vast and profound. Both Patanjali and the Buddha gave step by step instructions in how to liberate one’s Awareness from the seeming and apparent. We are to recognize the transparency of all appears and appears to exist.